21-9-2013 - It is very important to Clean your Buell, XR1200 and Sportster Injectors from time to time. It is also depending on what gas you get for your bike at what gas station, and in what country you live. We use much more Ethanol in our gasolines then before. Here are some fact's about what Ethanol is doing with our Buell's or XR1200 or Sportster. In every country the amount of Ethanol can vary. We bought a Fuel injector test and clean machine to do this service In-House. Ethanol is created when crops such as sugar-cane, maize, sorghum, wheat and other grains, or even cornstalks, fruit and vegetable waste is fermented and distilled. Ethanol blends dramatically reduce emissions of hydrocarbons. With the introduction of Ethanol in our gasoline came a boat load of problems so speak. The affects of Ethanol was never properly tested before its introduction thus leaving many in various industries to foot an ongoing, unnecessary and most of the time very expensive bill. Even some aircraft using automotive based gasoline was affected. Since the introduction of Ethanol, the problems with gasoline are slightly different, but nevertheless just as alarming. Ethanol is very hygroscopic and will absorb moisture from the atmosphere directly into the fuel molecules. Water found in gasoline sinks to the bottom of the tank. For both retailer and end user, this is a very serious problem, but more so for the end user because it is the end user that most of the time has to foot the bill for expensive fuel system and engine related repairs. ETHANOL CAUSE FUELL INJECTOR PROBLEMS. 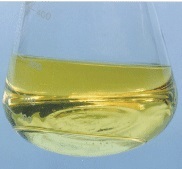 When gasoline containing Ethanol comes in contact with water, either liquid or in the form of humidity; the Ethanol will pick-up and absorb some or all of that water. 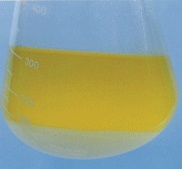 When it reaches a saturation point the Ethanol and water will Phase Separate. 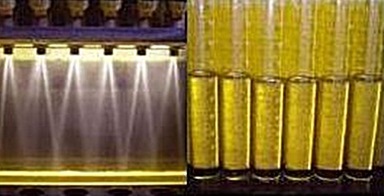 Phase separation is when the water content in the fuel tank builds up to a level where separation of the ethanol and gasoline takes place (picture 2 below). Reports have suggested that a fuel tank content of just 0.35% of water will lead to phase separation. What you are left with then is a layer of water on the bottom of the tank, above it will be the layer of ethanol and above that will be the remainder of the unleaded gasoline. This fuel is deemed useless and corrosive, and if used will cause havoc in fuel injection systems. Clogged and especial sticky fuel injectors is but some of the related problems. No where is this more prevalent than in the marine industry where thousands of dollars are spent to rebuild engines and replace fuel related components such as fuel pumps and fuel injectors. It is therefore a good idea to manage fuel as closely as possible. Try to ensure your fuel tank is empty when the Buell or Sportster are stored for periods of time. Fuel injector maintenance such as fuel injector cleaning and flow testing should be done on a regular bases for your Buell. It is also recommended that Buell Fuel pumps are properly cleaned and serviced on a regular bases because the fuel that cause dirty injectors or clogged injectors are pumped through these very expensive and sensitive fuel pumps, that will be obsolete in a few years. Using gasoline in your Buell means you are being affected by Bio-Ethanol in your Buell or Sportster. We bought a Nice Injector flow tester and ultrasonic cleaner. We are very happy we can offer this in-house service specially for Buell's and Sportster cause that is the only thing we do. 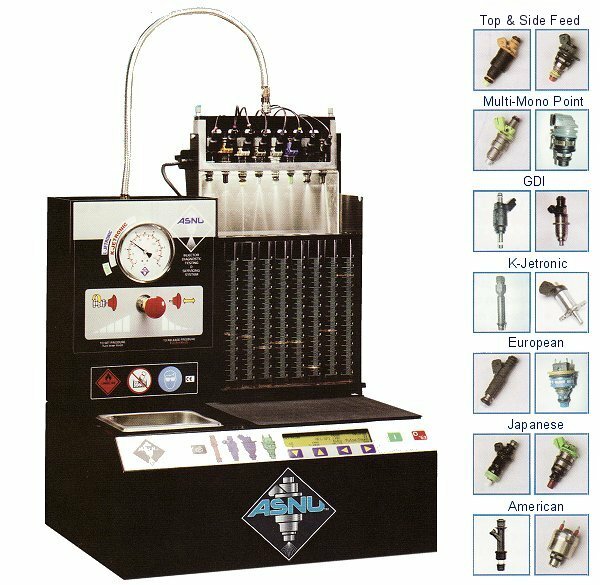 We offer the service to flow match your injectors and to clean them so you are 200% sure the data in The ECM that is used to get your the right amount of fuel, comes out in your cylinderhead and you are not running a lean mixture on your Buell. Here is a picture that shows the injectors when not cleaned and there behaviour. Look at the glasses and see how different the volume is. Here you can see how it needs to look like, all are the same volume. Here is another picture to get a idea what can happen in your cylinder head when you drive with dirty injectors. Other than it “feels” if the engine runs better there is just no way to verify or confirm that the money spent on fuel injector cleaners was worth it because visual inspection of fuel injector spray patterns and flow rates are not possible. leaning fuel injectors by removing them from the engine and then proceed with a process of visual inspection, ultrasonic cleaning and actual flow testing for spray patterns and volume is the only accurate, guaranteed, reliable, and sure way to confirm a clean fuel injector and that your fuel injectors are doing their job. Anything ells is only guess work. And Here is something for our gear heads. Proper fuel injector atomization cannot be determined. 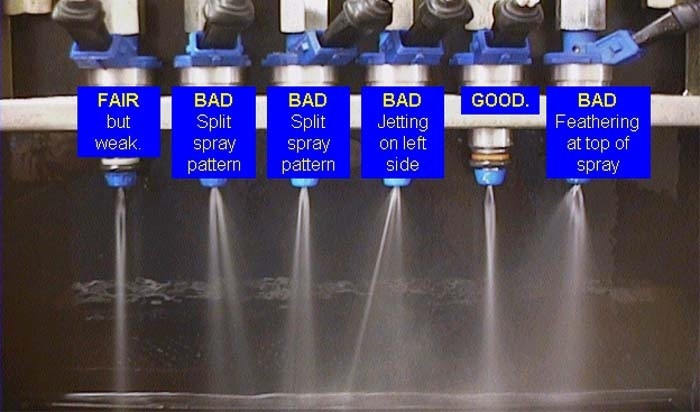 Correct fuel injector spray pattern and distribution cannot be determined. 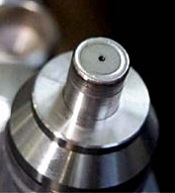 Damaged pintle caps, bad, cracked or torn O-rings cannot be discovered. It cannot be determined if the fuel injectors has leaking pintle, disc or ball valves. It cannot be established if fuel delivery for the fuel injector set is equal. Injector Cleaner can only clean what it touches! Liquid in its natural state or under pressure will always follow the easiest path. 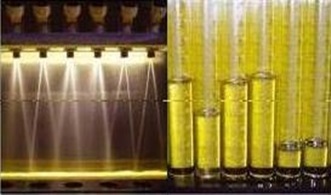 It therefore becomes clear and understandable why some fuel injector cleaning methods such as fuel injector cleaning chemicals in the form of, fuel tank additives or fuel rail induced injector cleaners more often than not does not do a good job of cleaning the internal components of the fuel injectors. Fuel injector cleaner in the form of chemicals cannot distinguish between the various components it touches and therefore will have a cleaning effect on everything it comes in contact with. In theory this is supposed to be good but in practice this more often than not has the opposite effect. Grime and dirt loosened by the fuel injector cleaner from the various fuel system components such as the fuel tank, fuel lines and fuel rail are sent directly to the fuel injectors. Since the filter baskets inside the fuel injectors are only between 3 and 10 microns in size they become clogged very quickly. In some cases fuel rail induced injector cleaner will damage the filter baskets and allow for larger pieces of debris to enter the fuel injector. This can cause the pintle to become stuck or if the debris lodges itself on the pintle, ball or disc seat the injector will start to leak. Leaking fuel injectors is not only a fire hazard but can also cause engine damage. Some of the products might even be harmful to expensive components such as catalytic converters, oxygen sensors and other components.